Guadalupe Peak is the highest point in Texas at 8,749 feet – about 4 years ago, I tried climbing it and didn’t quite make it to the top. Last month, though, I finally beat it. 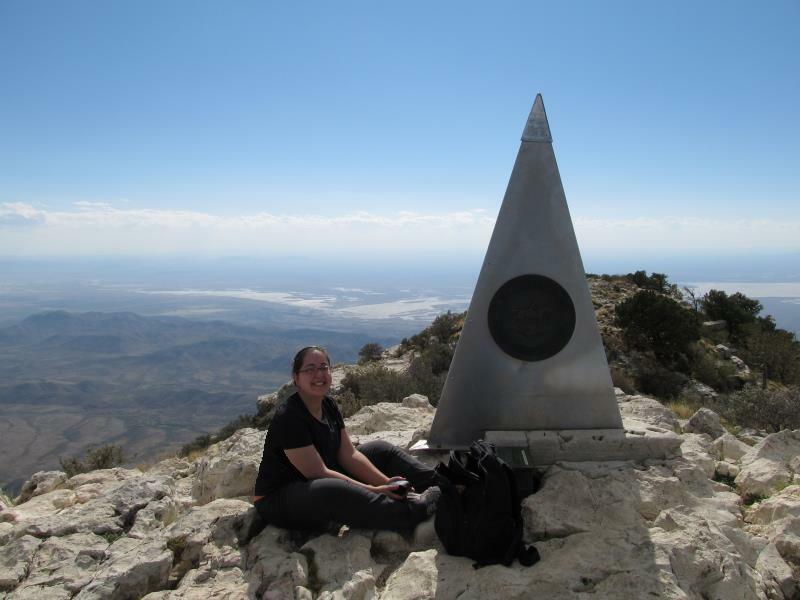 To commemorate the 8.4 mile/3000 foot elevation gain hike, I am cataloging the monument at the top of Guadalupe Peak at Guadalupe Mountains National Park in Texas. My mother would have made me take my hair down for this picture. 245 0 0 Guadalupe Peak monument /|cAmerican Airlines. 300 1 stainless steel trylon :|bill. ;|c183cm. 610 2 0 American Airlines, inc.
610 2 0 United States Postal Service. 650 0 Guadalupe Mountains (N.M. and Tex.). 650 0 Guadalupe Mountains National Park (Tex.). The LOC has a pretty great selection of narrower terms for “Monsters” (which I got to by searching Enigma>Curiosities and wonders>Monsters … I don’t know why I searched for Enigma in the first place, but it seemed like a good idea at the time), including Harpies, the Mothman, and chupacabras. It also gives “Monsters” the alias of “Animals–abnormalities,” which makes the chupacabra sound much nicer. It’s not a goatsucker; it’s a coyote with some abnormalities (if you believe University of Michigan scientists, it’s mange), which doesn’t sound nearly as terrifying. *Disclaimer: This record, in all its hypothetical grandeur, was not actually entered into any existing catalogs. Any mis-appropriations of MARC fields are not intended to offend any catalogers that have more experience than myself in cataloging memorials on mountain summits.